Golden Pearls is a complete range of micro encapsulated diets for shrimp larvae as well as ornamental fish applications. This larval diet is a result of a revolutionary technique involving a new micro-encapsulation process for the smallest particles (5-50 µm) and an innovative agglomeration of micro-encapsulated particles to produce larger particles (50-100µm, 100-200 µm, 100-200 µm, 200-300 µm, 300-500 µm, 500-800 µm). The technology for the production of these particles results in a highly palatable and digestible diet that mimics live Artemia nauplii. In commercial shrimp hatcheries, Golden Pearls can effectively replace 50-80% of the live food requirement for marine shrimp larviculture without compromising post-larvae quality. 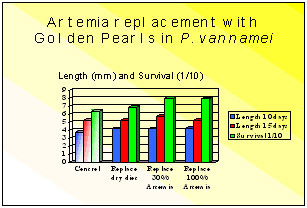 Feed one to four kilos of Golden Pearls per million PL. Feed 3 to 10 g/m3/day. Feed 4 to 6 times per day. Specific feeding regimes are available on request. 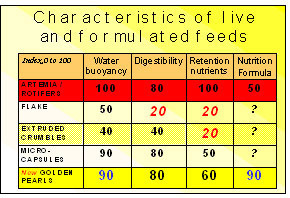 In this table, Artemia is an excellent feed source for the conditions mentioned above. However, its effectiveness does decrease noticeably in regards to nutrition. Artemia is deficient in Essential Fatty Acids (EFA). The nutritional value of formulated feeds will of course depend on the experience and skills of the formulator. Flake food in general is lacking in regards to digestion but their buoyancy is adequate. Extruded crumbles exhibit better digestibility traits but will tend to sink more rapidly. Capsules and agglomerated micro-capsules (Golden Pearls) are an optimal solution to the problems of buoyancy, digestibility and leaching. Because this product is formulated, Golden Pearls is a viable feed option and supplement to Artemia in regards to product effectiveness and cost savings. The Golden Pearls capsules contain soluble proteins that are essential in the early developmental stages of the shrimp larvae or fish larvae. The particles do not sink due to the high buoyancy of the micro-capsules. The particles are highly digestible as large amounts of soluble proteins are contained and protected within each capsule. The leaching is reduced by the very efficient protein wall. The formulation technique allows the production of strong units of various sizes. In general, particles composed of multiple smaller capsules are much stronger and digestible compared to a single large capsule. The SEM picture (scanning electronic microscopy) shows a capsule of the Golden Pearls feed. The capsule is approximately 50 µm in size. Other capsules ranging from 10 to 25 µm are also present. The following graph is the result of testing conducted at a commercial shrimp hatchery in Ecuador. The application of this product resulted in notable increases in survival rates. The combination of this factor along with the cost savings and the relatively ease in product application has resulted in continued usage of the Golden Pearls larval diet in many shrimp and fish breeding facilities worldwide. Ingredients and typical composition: Artemia, squid, shrimp and fish proteins, purified fish oils, phospholipids, astaxanthin, vitamins and protected minerals, antioxidants, immuno-modulators. Spirulina is one of the most concentrated natural sources of nutrition know for both terrestrial and aquatic animals. Early interest in Spirulina focused mainly on its potential as a source of protein and vitamins. Spirulina is 60-70% protein by weight and is the richest source of Vitamin B-12 and Beta carotene (twenty times that of carrots) and is also loaded with essential fatty acids and minerals. Today, there are several commercial companies in the U.S., China, and India culturing Spirulina primarily as a food supplement for the health food markets. More recently, there has been new interest concerning the therapeutic effects of Spirulina as a "probiotic" or booster for the immune response system in animals and fish. What are probiotics and why should you feed them to your fish? Probiotic means "that which promotes life", as opposed to antibiotic which means "against life". Both types of therapy have their place in fish husbandry. While antibiotics kill microbes and harmful bacteria after an infection has occurred, the probiotics will help to prevent the infection from occurring in the first place. The publics growing interest over the use of probiotics or holistic type medications. Increased and more uniform growth rates when fed at the recommended .5-2.0% inclusion rate. Spirulina improves the intestinal flora in fish by the breakdown of otherwise indigestible feed components, thereby extracting more nutrition from the feed. The same beneficial flora or bacteria produce vitamins and displace harmful which is why fish fed Spirulina have less intestinal compaction, a slimmer abdomen, and are more resistant to infection. Spirulina stimulates the production on enzymes that transport fats within the fish s body. The fish utilized the fat to power growth instead of just storing it and becoming flabby. The 5 ppt carotenoid pigments that are concentrated in Spirulina algae improve and intensify the coloration in fish. This is especially important for koi and goldfish for commanding a higher price in the marketplace. Chlorophyll and phycocyanin also enhance the skin colors. Studies in Japan on marine yellowtail showed that fingerlings fed a ration of 0.5% (5 ppt) spirulina resulted in a significant gain in survival over the non-Spirulina fed group. Similar results were obtained from professional Discus fish breeders whom incorporate Spirulina powder into the diet for newborn Discus fry. Fish farmers have found that including Spirulina in the diet reduced the amount of medication or therapeutics that are normally required to treat sick fish. Spirulina also reduced toxicity of medications and may itself have anti-viral properties. Most disease treatments on the market are "water baths" in which the fish must absorb the drug from the aquarium water. Unfortunately, the treatment water is often discharged down the drain into our environment and waterways. Orally feeding your fish a diet containing Spirulina could effectively reduce or eliminate the need for bath treatments. Using Spirulina algae as a "prophylactic" treatment in place of antibiotics can effectively reduce wastewater pollutants, eliminating costly treatment systems and increases the effectiveness of existing systems. ClorAm-X™ is a single-phase, dechlorinating (chlorine removing), deaminating (ammonia removing), and dechloraminating (chloramine removing) agent. It is a white powder that is essentially odorless (upon long-term storage the product may develop a very slight odor) and completely soluble in water. Dosage: use 1 teaspoon (~ 5 mL) per 10 gallon of water. ClorAm-X™ if kept in its original container will remain stable for an indefinite period of time. Store in a cool dry environment. Do not return unused portions to the original container. ClorAm-X™ may be used on fishes intended for human consumption. The United States Food & Drug Administration (FDA) has determined that the use of the chemical that constitutes ClorAm-XTM (sodium hydroxymethanesulfonate) in water with fishes, intended for human consumption, does not come under FDA jurisdiction. USE WITH CRUSTACEANS AND MOLLUSKS (SHELLFISH):As with fishes intended for human consumption, ClorAm-X™ may be used on shellfish intended for human consumption. In the FDA's letter of determination, the agency states that the use of the chemical that constitutes ClorAm-XTM, in water with aquatic invertebrates (e.g. lobsters, shrimp, crabs, clams, oysters) intended for human consumption, does not come under FDA jurisdiction. MARINE INVERTEBRATES: During the development of ClorAm-X™, successful shipping tests were conducted with a wide variety of marine invertebrates: shrimp (e.g. penaeids and Stenopus hispidus), Octopus bimaculoides, American lobster, Turbo and Conus snails, Aplysia, various squid species, tropical and cold-water sea stars and sea cucumbers, Metridium and Condylactis anemones, and hermatypic corals (e.g. Trachyphyllia geofroyi). Additionally, over the years that ClorAm-X™ has been on the market, it has been used commercially by soft-shell crab distributors to prevent ammonia accumulation during the period the crabs are held before and during their molting. FRESHWATER INVERTEBRATES: ClorAm-X™ has also been extensively tested with freshwater mollusks and crustaceans. These have included species of snails, shrimp and crayfish. 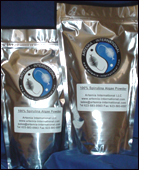 The product is routinely used for ammonia control in the shipments of both freshwater and marine invertebrates intended for the aquarium and bait trades. LIVE FISH FOODS: ClorAm-X™ is routinely used in the packaging and shipping of live aquatic invertebrates sold as live fish feeds. Brine shrimp (Artemia spp. ), glassworms, bloodworms, blackworms, Daphnia spp., etc., have been, and currently, are being held, shipped and packaged in water treated with ClorAm-X™. ClorAm-X™ is a trademark and manufactured by AquaScience Research Group. ClorAm-X™ is protected under United States and foreign patents.